Kim Kardashian shows off full Balmain Army | HELLO! Forget Taylor Swift: nobody gives us bigger squad goals than Kim Kardashian. She took to Twitter on Thursday afternoon to share a picture of her seriously influential and fashionable friends and family – and have you ever seen a better looking bunch? Alongside Kim and husband Kanye West, Kylie and Kris Jenner, Balmain's creative director Olivier Routeing, Cindy Crawford and models Jourdan Dunn and Sean O'Pry are seen in the fierce photo, which the Keeping up with the Kardashians star captioned: "Balmain Army". The snap shows Kim and co. in the gorgeous outfits they wore to this year's Met Gala, which had the theme Manus x Machina: Fashion in an Age of Technology, and they all definitely looked stylishly robotic. As well as making us all jealous with her cool pals, Kim, 35, has also been making her fans' dreams come true. When a Twitter follower tweeted their frustration at 39-year-old Kanye's latest Yeezy release selling out in 13 seconds, it was Kim to the rescue. She replied: "What size shoe are u? 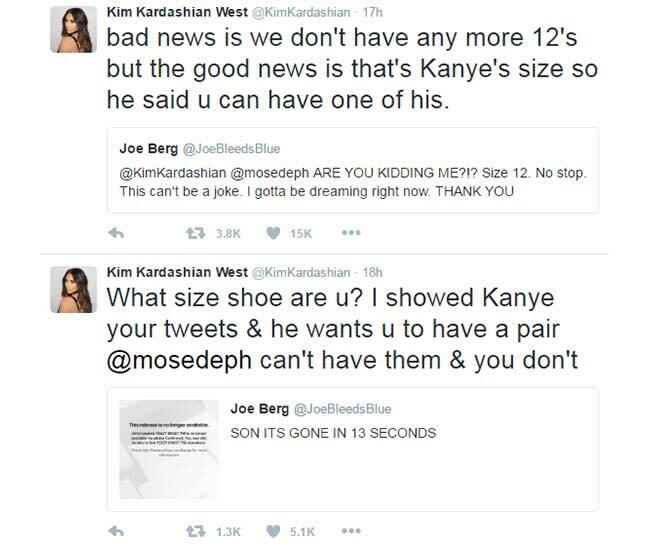 I showed Kanye your tweets & he wants u to have a pair." Understandably the Kimye fan was over-the-moon with the response and, even when Kim found there were none left in his size, she had a solution. Kim added: "Bad news is we don't have any more 12's but the good news is that's Kanye's size so he said u can have one of his." The Wests: they're like modern day, Balmain-wearing superheroes, aren't they?